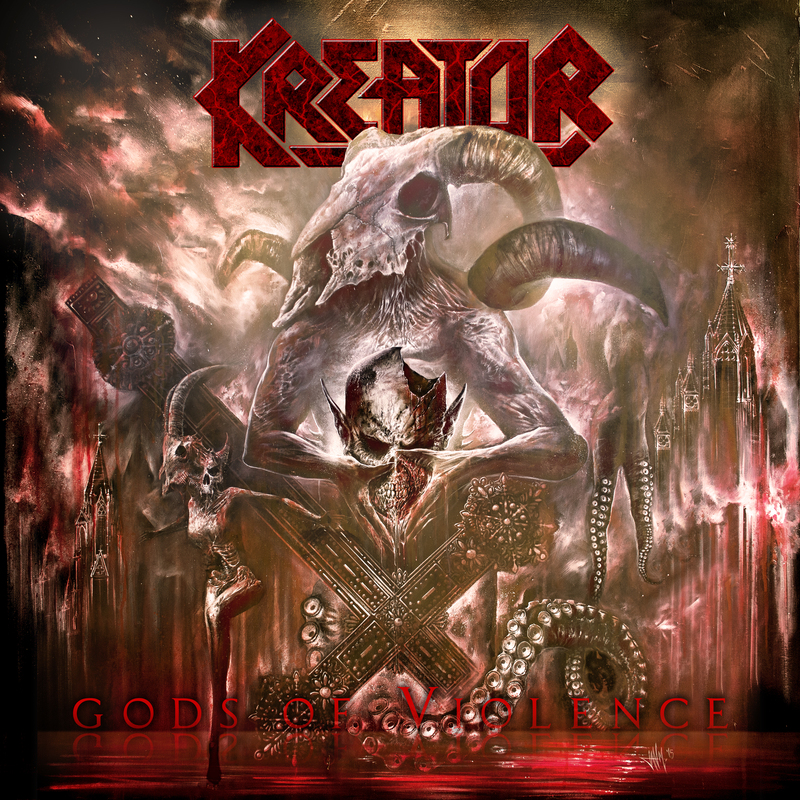 German Thrashers Kreator Upcoming Release Gods of War - Welcome To All That Shreds Magazine! KREATOR‘s, who fascinatingly succeed in exploring new horizons while challenging and reinventing themselves time and again, resulting in high impact results – as is perfectly illustrated by their new record »Gods Of Violence« (out on January 27, 2017). With this 14th studio album of their impressive career, the thrashers from Essen, Germany have crafted a work of art of utmost vigor, drawing its unfailing power from the pounding heart of one of the greatest, most versatile metal bands of all time. »Gods Of Violence« lives and breathes! Like this, a key note of the album was found that is also reflected in the sheer brutality of ‘World War Now’, among others. The song‘s deriving from the observation that we‘re in the middle of a World War III of sorts, but not in the way we‘ve always feared: A-bomb dropped, humanity wiped out. “These days, our weapons of mass destruction are called hatred and religious delusion,” says Petrozza. It‘s a vertical war, being fought by the media as well as by fanatics of all shades. The intro leading to the opening track ‘Apocalypticon’ is already setting the proper bombastic pace for the album‘s basic idea: Marching drums and a Wagnerian choir are opening an extraordinary metal masterpiece that‘s contrasting brutality with fragility, excelling in an exemplary handling of momentum and dynamics. Even ‘Death Becomes My Light’, the final eight-minute-epic dealing with a near death experience, is not a single second too long: »Gods Of Violence« flashes by like greased lightning. The ability to form universally comprehensible messages out of such sophisticated trains of thought as found on »Gods Of Violence« has always been one of the traits of a man whose pop-cultural universe ranges from Hannah Arendt, PINK FLOYD and TOCOTRONIC to SLAYER. Mille Petrozza was born and bred in the metal scene. Nevertheless, he is and always has been open to inspiration from various sources, which is why his lyrics on this album are by no means merely based on corny genre templates but offer trenchant observations of our time combined with a witty advance towards inflated cliches: One of the best songs on »Gods Of Violence« is really called ‘Satan Is Real’. Finishing »Gods Of Violence« took the band – featuring Petrozza, Sami Yli–Sirniö (guitars), Christian “Speesy” Giesler (bass) and Jürgen “Ventor” Reil (drums) – about three years. After Petrozza had pre-produced all of the eleven tracks in winter of 2015, KREATOR went to Sweden in order to team up with legendary metal producer Jens Bogren in his Fascination Street Studios once again. What emerged from the recording sessions was bound to fundamentally redefine what KREATOR is all about. An opus that surprises with some lines in German and an unexpected guest in the form of indie pop artist DAGOBERT. Moreover, Italian death metallers FLESHGOD APOCALYPSE lent a hand with the orchestral parts of four songs and 12-year-old Tekla–Li Wadensten played the harp for »Gods Of Violence«. In fact, it wasn‘t until said debut album that the name KREATOR was established in the first place. Before, the combo had been known as TORMENTOR. The early years were defining ones all the same: “None of us knew how to play our instruments properly back then,” Petrozza remembers. “Though we were a pretty mediocre student band indeed, we taught each other how to play – it‘s stuff like that you bond over.” This early stage laid the foundation for an exceptional career that would see KREATOR rise to become part of what’s to be considered the German equivalent of the Californian Big Four (METALLICA, SLAYER, ANTHRAX, MEGADETH) of thrash metal – the Big Three of German thrash, alongside SODOM and DESTRUCTION. It was on their third album »Terrible Certainty« that KREATOR would precisely define some of their most characteristic traits: Power riffing and aggressive shouting always meet a sure feeling for complex arrangements and highly memorable songwriting that is not to be taken for granted within this genre – KREATOR know their choruses better than most. An ability that makes them stand out in the international music scene as well: Over the years, KREATOR have sold more than two million albums worldwide and have played countless shows all around the globe.